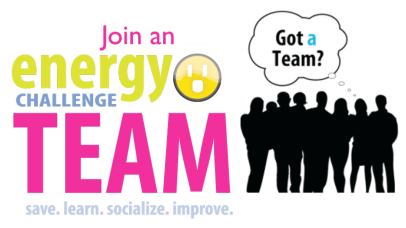 If you live in Central New York, you might be interested in forming an Energy Challenge Team. The Central New York Energy Challenge Team is a free and voluntary program designed to encourage households to improve their energy efficiency and reduce their carbon footprint through a process of shared learning.� Team participants are provided with the tools to take actions that reduce their household energy usage, benefitting the environment and their wallets at the same time. The Energy Challenge Team program utilizes a cooperative team-based format so that participants have the support they need to succeed.� Teams are made up of 5-8 households inclusive of a team facilitator.� The facilitator is responsible for recruiting members and conducting meetings according to a provided guidebook, each team member receives a workbook.� Teams meet for approximately one hour each week over the course of 6 weeks to learn and discuss ways to save energy. Previous participants in the program have achieved a 29% savings in energy usage. Energy Challenge teams provide a fun and supportive environment where participants can learn to improve their energy efficiency while saving money, improving comfort in their homes, and enjoying the company of neighbors and/or colleagues. If you are interested in forming an Energy Challenge team, please contact Sam Gordon, CNY Energy Challenge Coordinator* at sgordon@cnyrpdb.org or (315) 422-8276, ext. 204. *The CNY Energy Challenge is an initiative of the Central New York Regional Planning and Development Board, a public agency serving Onondaga, Cayuga, Cortland, and Madison Counties.